Embedded Systems Solutions – An Elite Partner for Intel Software Products. Intel® System Studio and Intel® Parallel Studio is comprehensive and integrated tool suites that provides developers with advanced system tools and technologies to help accelerate the delivery of the next generation power efficient, high performance, reliable embedded, mobile and Super computing devices. Intel® System Studio 2014 now allows you to develop for embedded & mobile Android* and Tizen* IVI systems, added cross development from Windows* hosts, and provides expanded JTAG debug support for all IA platforms. The new agent based UEFI debug helps the system developers to accelerate time-to-market and strengthen reliability of these increasingly complex embedded and mobile systems. Eclipse* integration and cross-build capabilities allows for faster system development with Intel® System Studio 2014. Faster code: Boost applications performance that scales on today’s and next-gen processors. Create code faster: Utilize a toolset that simplifies creating fast, reliable parallel code. CREATE FASTER CODE – FASTER! Intel® Parallel Studio XE is a suite of software development tools combining industry-leading compilers, performance libraries, error checking and performance profiling. The suite enables software developers to get high performance on today’s and tomorrow’s Intel® Xeon® and Intel® Xeon Phi™ processors and coprocessors. The suite simplifies the creation of fast, reliable parallel code for C++, Fortran, and Python*. Your software needs to run faster. It performs tasks that need to get done sooner, not later―including big data analytics, image analysis, machine learning applications, time-critical financial analysis, and simulations. Intel® Parallel Studio XE is a software development suite that helps boost application performance by taking advantage of the ever-increasing processor core count and vector register width available in Intel® Xeon® processors, Intel® Xeon Phi™ processors and coprocessors, and other compatible processors. Developers can choose from three editions that meet their needs. Intel® Parallel Studio XE integrates into leading development environments, leveraging investment in existing code. The new 2017 version of Intel® Parallel Studio XE is better than ever. The premier suite for parallel applications gives you new software development tools to boost application performance—including Python* code, machine learning applications, and more—while simplifying the design, debugging, and tuning of parallel code. Boost application efficiency and performance for Intel Xeon and Xeon Phi processors using Intel® AVX-512 instructions. Accelerate HPC with high-performance Python. Easily access the latest Intel® Performance Libraries and Intel® Distribution for Python via APT GET*, YUM*, and Conda*. Quickly spot high-payoff opportunities for faster code using the combined performance snapshot feature of Intel VTune Amplifier for MPI, CPU, FPU, and memory use. New, broader redistribution rights for Intel Performance Libraries and Intel Distribution for Python. 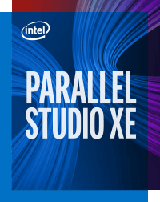 Intel Parallel Studio XE is available in three editions. Includes: Professional Edition plus a standards-based MPI Library, MPI communications profiling and analysis tool, MPI error checking and tuning tools, and a cluster diagnostic expert system. 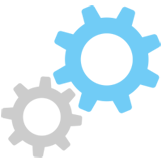 Build fast code using industry-leading compilers and libraries including a new data analytics library. Includes: C++ and/or Fortran* compilers, performance libraries, parallel models, and high-performance Python* packages powered by native Intel® Performance Libraries. Accelerating Python* performance on modern architectures from Intel. Get up to 97 times faster numerical processing on SciPy stack: NumPy, SciPy, and scikit-learn boosted by the Intel® Math Kernel Library. Speed up data analytics with pyDAAL and parallelize Python workloads with enhanced Intel® Threading Building Blocks (Intel® TBB). Manage packages and Jupyter Notebooks easily with conda, Anaconda Cloud, and PIP. Intel® Distribution for Python*, powered by Anaconda, gives you ready access to tools and techniques for high performance to supercharge all your Python applications on modern Intel platforms. Whether you are a seasoned high-performance developer or a data scientist looking to speed up your workflows, the Intel Distribution for Python powered by Anaconda delivers an easy-to-install, performance-optimized Python experience to meet even your most demanding requirements. The all-included, out-of-the box distribution accelerates core Python packages including NumPy, SciPy, pandas, scikit-learn, Jupyter, matplotlib, and mpi4py. It integrates the powerful Intel® Math Kernel Library (Intel® MKL), Intel® Data Analytics Acceleration Library (Intel® DAAL) and pyDAAL, Intel® MPI Library, and Intel® Threading Building Blocks (Intel® TBB). Parallelism Brings CAD Exchanger* Software Dramatic Gains in Performance and User Satisfaction, Plus a Competitive Advantage. Some heavyweight computational algorithms, such as blended surface approximation, were accelerated by 15X over single-thread mode. Multi-threaded visualization significantly increased the responsiveness of the GUI application, which in turn improved the user experience. Less time spent waiting means more time to interact and innovate. Parallel file I/O is 2.5× faster, and visualization time was reduced by up to 4X. Intel® Parallel Studio XE simplifies the design, development, debug, and tuning of code that efficiently uses parallel processing. It played a major role in boosting the CAD Exchanger team’s productivity. Intel® Threading Building Blocks (Intel® TBB), a component of Intel Parallel Studio XE, is an award-winning C/C++ library that enables high performance and scalability for parallel computing. Roman calls Intel TBB “the backbone of CAD Exchanger’s parallelism” and relies on it for the building blocks of parallel 3D model conversion, asynchronous I/O, and concurrent visualization of 3D assemblies. 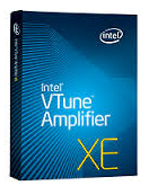 Intel® VTune Amplifier XE is a performance profiler that provides rich performance insight into hotspots, threading, locks and waits, OpenCL, bandwidth, and more. The team relies on the tool to detect bottlenecks and analyze scalability. Intel® Inspector XE is an easy-to-use memory and threading error debugger used to identify issues such as leaks and allocation errors, deadlocks, and data races. No special compilers or builds are required, just a normal debug build. Is Python* Almost as Fast as Native Code? Believe It!